The Peerplays network has launched. Normally, I would have dismissed this as it is just another coin, why should I care? I care because @xeroc, a talented individual whom I have a lot of respect for is involved with the project. I care because I see familiar names in the Peerplays telegram group. I care because I sense a healthy dose of pragmatism in the project. The gaming industry is ripe for disruption, and in my opinion, Peerplays has solid fundamentals, and is well positioned as a disruptive force for the next couple of years. Earlier this year we have attempted to create a prediction market prototype on Steem with SteemSports, however we ran into several challenges, which have been elegantly solved by the Peerplays team. I think there is a tremendous opportunity for developers to build games and prediction markets on top of Peerplays, right now. I am very excited to join the Peerplays network as a witness (furion). 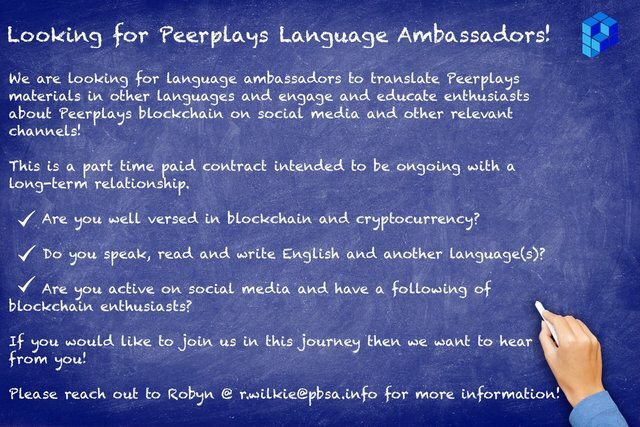 Being a witness on Steem, I am fairly confident in my ability to perform this role on Peerplays. I have setup a couple of servers, and my furion witness is up and running. I would like to thank @jesta for lending me 20PPY to setup a witness account. I am excited about learning more about the platform going forward, and finding ways in which I can contribute. That being said, I am currently dedicated to building a decentralized video platform, and I am concerned about the value I could bring to the Peerplays network in the short term. I don't want to be a leech on the network, and take a witness position, while some other, more dedicated person would be more deserving of it. I hope I can get what I invested in Peerplays. I believe he's saying he invested $40k at this point , I do hope you get a return but if you just kept it in BTS you were prob better off , that will be hard to beat , but hey this could skyrocket as well! He seems to be saying he invested $3K worth of BTS at the time of the sale but if he had held on to it instead it would be worth $40K as BTS right now due to the big weekend pump. So he's essentially hoping for 13.3x ROI out of PeerPlays to be equal to the lost opportunity. If anyone here is in the mood to vote for PeerPlays witnesses consider 'content-junkie'. Early investors who has the right information are always make the most profit out of their investments. 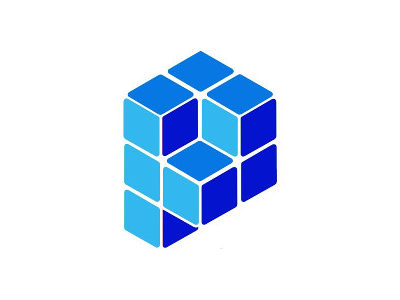 I'll have to take a look at Peerplays, I think anything that solves problems well and is geared towards the gaming industry has the potential to be a strong player. I'm internal so interested in the decentralized video platform you mention. I'll have to refer back to some of your posts (new follower here) unless you have a couple links handy? "I would like to thank @jesta for lending me 20PPY to setup a witness account." This is amazing teamwork to see happening here, live, for us all to witness and uplift. Thanks a bunch for the updates on PEERPLAYS, your witness roles and information about it all. Definitely appreciated from this end. Good luck, furion! It'll be a bit tricky for witnesses like us lower on the list to get in based on the wallet UI, but hopefully someday we'll get a chance. For now, there may be more network resources than are needed. Hi @furion I am a video content creator currently building up a following on YouTube. I have integrated my Steemit account with my YouTube production workflow, but I would really like to get involved with content creation on the beta of your video platform once it's at that stage. Is this possible? Also could you provide any information on how non-developers, who focus primarily on content, creativity, marketing or graphic design can play a part in Peer Play's development? The platform is still in development, please sign up on steemq.com as a creator to get an early invite. Thanks for the info. I signed up. I can tell by the signup form you are taking this project seriously. I'm excited. @furion I am dying to get my contents up in www.steemq.com but I already bugged u for the info regarding the release. And now hearing about signup for early invite is too damn exciting. So heading towards www.steemq.com for the sign up. Cheeers!!!!! Do you happen to have a blog specifically about this? I would love to know more. We ran into technical and people issues. As far as people issues go, we had divergent views on what direction should the project be taken in. I had been more interested in developing prediction games for different markets, but we also had something working with sports, and not enough momentum to bridge the gap. As far as tech goes, our games would have been semi-decentralized. The games are still provably fair, because all game details and wagers are recorded on the immutable chain (Steem), but there is counterparty risk (it might be somehow remedied with escrow). Peerplays on the other hand just nailed it. The Peerplays team has put a lot of effort into developing a robust, generally useful solution, so we eventually just conceded. You got it. I was the first to vote for your witness the other day. Need to look into this, again something different to look at ha! What is the total supply of Peerplay? It's an inflationary model like STEEM, there isn't a total supply. Unless you're asking what the total supply is right now, in which it's changing every moment! Yes, the total supply at this moment. This post received a 6% upvote from @randowhale thanks to @furion! For more information, click here! Congratulation for being one of the witness of PeerPlays. Regarding SteemQ, I think the Blockchain community is really forward to support this project. ANd even non crypto will really get a hand on a product that they are already experiencing with youtube. I saw it on bitshares the other day but there was some kind of block that wouldn't let me get any coins. I'm ready for them to release some games though!! you can buy it on cryptodao.com and from today also on CoinMarketCap.com ! But watch carefully for the prices because not so much exchanges on cryptodao.com and prices can change a lot from simple to double. Good luck. Still trying to figure where the wallet download link is! very interested to get in touch with you guys, just getting some artwork and ideas put down, video recorded then i'll be in touch. i want to help, i believe it could be great all around, for steem and peerplays and gamers in general. I am very interested in something you mentioned in your post: a decentralized video platform. Youtube has been censoring for political purposes, and we need to replace it, just as Steemit is replacing Facebook. Any other information, or some way to contribute to that effort by a layman? Exciting stuff going. It's a block chain explosion into every aspect of society. The new infrastructure. Just in time since the old infrastructure is dying. How fortunate you are to have the skills and education to be part of the spearhead. thanks for keeping us posted. Wishing you and the project well. This is interesting, I'll have to look into it further. Well said, sir. Hope you will tell about this in the future and laugh at what seemed impossible. great post ! thanks for your infos! This is a very nice step, both for me and for all of us. Well ,you got it .I would like to thank @jesta for lending me 20PPY to setup a witness account. It is invest for long term .this is the opportunity of the steem . I will upvote you , please support me . i ,m new in the steem . It seem a promising project. 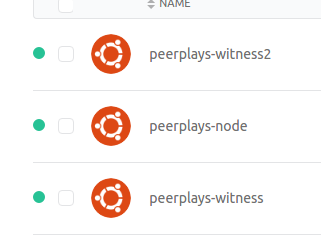 I should probably check into this peerplays project. I Keep on hearing about it, & its potential looks promising! Thank you for sharing! I have a question for the one who reads this. I have some Peerplays tokens on my Bitshares account. I need to convert it to PPY tokens. To do that, I need the redemption key, but I only have a BIN file (wallet back-up). To acces my Bitshares account I upload the file there and it is done. The back-up file is the private key (for as far as I know). But my new Peerplays wallet wants my redemption key, but I don't know what that number is. The Peerplays wallet does not allow me to upload that BIN file. There must be a way to find that number somewhere within my Bitshares account. Very interesting. I look forward to hearing more about how Peerplays can accomplish those goals you noted. Does this help with the challenges of launching SteemQ? From my experiences investing in crypto currencies, early investors are always make the most out of their investments due to the fact that they have gathered enough information for them to decide to invest. In addition that, event is the do not have enough information but they believe in their gut feeling and they are the one who ready to take risk. The most riskiest in life is not the risk itself instead not taking risks. Hey @furion what happened with SteemQ? Went through and updated my witness votes(actually how i found your steemit page). Judging from your posts you seem pretty involved in the crypto world! And seem like a great person to have on board, so you get my vote :).